Part of running a successful business is saving money where it matters. 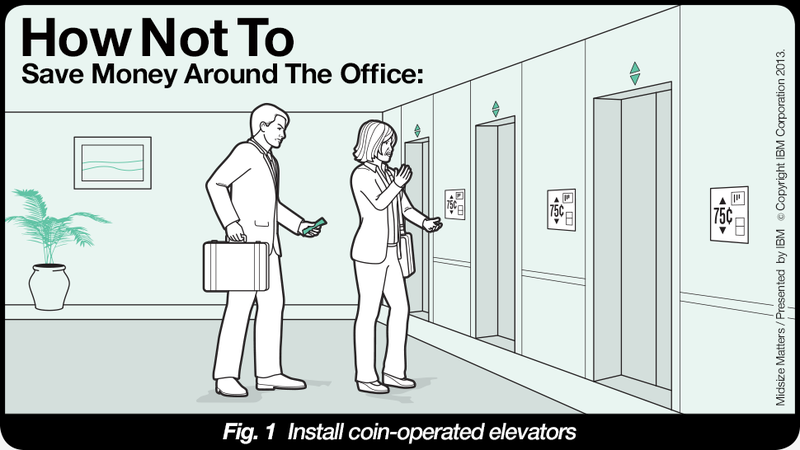 You thought that you could do just that by installing a few pay elevators around the office. (Hey, if an employee wants to move between floors, the company might as well get a cut, right?) Wrong. Instead, your staff is now too broke to afford transportation to the office – not to mention extremely annoyed from standing in long toll lines. Not ideal. Ding, ding, ding! It’s the cloud. The business world has slowly but surely embraced the cloud as a means of staying connected while saving money on power and IT infrastructure, allowing people to work and innovate from just about anywhere while an offsite server stack does all the heavy-lifting. In fact, market intelligence firm IDC predicts that midsized companies that spend on cloud solutions will grow by almost 20 percent over the next five years. And it's how cutting-edge biotech outfit Finceramica continues to save lives. Based in Faenza, Italy, Finceramica manufactures an innovative bioceramic that allows physicians to create specially-designed implants for patients suffering from traumatic injuries. The material itself helps promote tissue regeneration in everything from dental surgery to even neurosurgery. You'd think surgeons would want the tech promoting their patients' well-being directly at their fingertips, but, at first, it was considerably more complicated (and expensive). The CT scans showing injury data and 3D models of bioceramic prosthetics had to be relayed back and forth between surgeons and Finceramica by courier, a costly system that's pretty prone to delays and human error. Sound very cutting-edge? Instead, Finceramica turned to IBM's private cloud services to create a way for surgeons to keep track of the entire process while cutting out the middleman. Working with IBM Business Partner TECLA.it, they created a fully integrated and secure web portal called the "Custom Bone Service," which surgeons could log into using any modern browser to create a new clinical case with all the relevant patient data needed to create an implant. They and Finceramica could then work in concert to create something the patient needed 30 percent faster, reducing the workload and staff needed by 20 percent. So feel free to get rid of those treadmills, and turn on the lights. They’re not going to save that much money. Instead, you can save while still innovating with IBM’s wide array of business solutions. This post is part of the IBM Midsize Matters Series, in which business solutions are demystified, just for your midsize business. Visit IBM for Midsize Businesses on Facebook, Twitter, and LinkedIn to join the conversation. "I&apos;m really glad we hired that in-house psychic," said no one, ever. IBM, the IBM logo and the Smarter Planet icon are trademarks of International Business Machines Corp., registered in many jurisdictions worldwide.